Inmiddels rijden de trams uit Wenen ruim een jaar rond in Utrecht. Ze rijden een 15 minuten Sneldienst tussen Nieuwegein Zuid en Utrecht, zodat met de twee andere verbindingen tussen Nieuwegein Centrum en Utrecht een 5 minutendienst ontstaat. Blijkbaar is er materieel tekort. Sommige treinen bestaan uit 1 ipv 3 rijtuigen. De nieuwe RET SG3 stellen in actie op de oost-west verbinding. Deze stellen vervangen de metro's van het type SG2 uit 1980-1984 waarvan er in deze film ook nog enkelen te zien zijn. 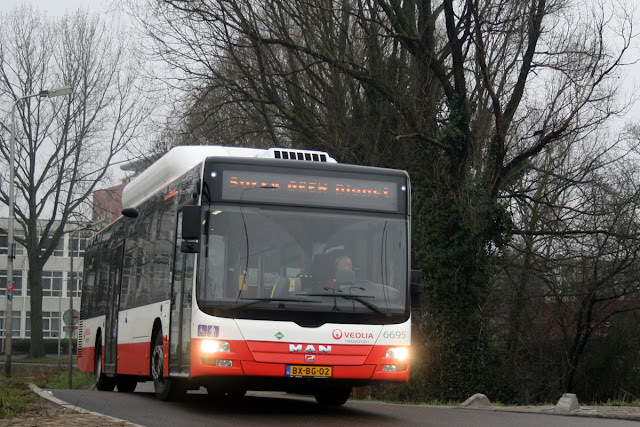 Er verschijnen niet vaak boeken over busbouwers. Nu is er een boek over de Noord-Ierse busbouwer Wright, bekend van de in Nederland bij Arriva rijdende Wright-Commanders. In dit rijk geillustreerde boek, beschrijft de schrijver zijn carriere bij deze firma, begonnen als timmerman en eindigend als sales-manager. Het boek is dan ook geschreven vanuit het perspectief van een enthausiaste Wright medewerker. Zo wordt bij de foto van een Nederlandse Arriva Wright trots vermeld dat deze bussen door Arriva werden ingezet rondom de fabriek van concurent VDL Berkhof....Desalnietemin een leuk boek over één van de grootste busbouwers in de UK. Although this book looks like a history of Wrightbus, one of the UK's most successful bus builders, this is really a memoir of one of its longer serving employees. The reviewer has had the pleasure of meeting a few Wrightbus directors although not the author, described by one of his customers as a `certain larger than life Sales Manager' and by another as a `lovable leprechaun'. So the book is not a corporate history but none the worse for that. It provides a rich tapestry with lots of personal detail and anecdotes. Nevertheless there is a story: of a carpenter - Robert Wright - who responded to a request to do repairs on the van of his local Co-operative Society in his hometown of Ballymena, Northern Ireland. Convinced he could do as well building bodies as repairing them, he set up as a coachbuilder in 1946. The firm built mobile shops, mobile libraries, tipper truck bodies, flat bed trailers and even armoured cars. The first buses were for the local education authority in 1955 and then touring coaches for Irish show bands. Only slowly did the firm begin to win orders for more conventional buses but in 1976, the decision was taken to concentrate on the public service vehicle (PSV) market. This was the time of the Troubles in Northern Ireland when it seemed to those outside the Province that terrorist activities were a daily feature of life there. One of the main sales challenges was to convince customers that Wrightbus could deliver despite the difficulties. Usually they were won over by Irish charm, friendliness and trust. Nor does the reader have to take the author's word for this. The book contains some 18 contributions from customers, suppliers, journalists and consultants, including Peter Hendy, Sir Moir Lockhead, Doug Jack among others. Although labelled `endorsements' they are closer to affectionate pen portraits. A recurrent theme through the book is the powerful yet benign influence of Dr William Wright, OBE, son of the founder. His contribution to the success of the company in identifying strategic directions is well described. Less well covered - at least for those who like their dates - is the chronological sequence of how the different models of developed. However the reader gets a good insight into how important relationships with suppliers were. Bedford was an early favourite until it withdrew from UK manufacturing. Dennis was another close buddy especially in the era of the Handybus and together the companies made a big impact on the London market. We read how they fell out through a breach of trust. Volvo has provided the closest association over the years. The writing is a touch leaden in places when describing how the sales openings were won with the major customers such as Grampian, MTL, Greater Manchester, West Midlands and others. These episodes almost seem like an opportunity to name drop the various executives involved. Wrightbus became a `big bus' supplier in the 1990s and was early in identifying low-floor for the future. The story of how the concept originated and how it evolved to the accessible bus of 1994 is interesting. The transformation of Wrightbus to an industry leader came in 2000 with the Millennium series. The Volvo Eclipse and the Scania Solar were the starting points to be joined by the VDL Pulsar two years later and then the MAN Meridian. The Fusion articulated variants and the Gemini double-deckers take the story up to the retirement of the author in 2005. The last chapter describes Wrightbus subsequent work with hybrids, fuel cells, and the Streetcar. There is an appendix listing detail of each type of bus produced and an index. For people in the bus business it gives a thorough insight into those involved at all levels with the success of the Wright Group (as Wrightbus became). For bus enthusiasts who may, perhaps, be less interested in the people, they will be amply rewarded by the abundance of photographs of buses and bus stories. This is a thoroughly enjoyable book.